An award-winning industry leader, Tula is proud to offer beautiful, easy-to use, versatile, and long-lasting carriers which provide a comfortable, ergonomic method of supporting the bond between caregiver and child from birth through toddlerhood and beyond. Archer is a fresh modern print that instantly makes parenting cool! Archer has a repeating pattern of arrows on a gray background, accented with a mustard yellow leg padding, on light gray canvas. Make function fun with Archer's appealing style. 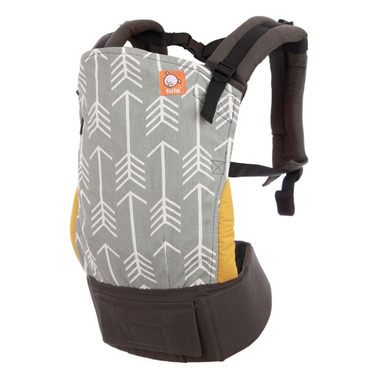 15lbs - 45lbs (7-20kg) / Can be used from 7-15lbs (3.5-7kg) in combination with a Tula Infant Insert. Not included and sold separately. By far the most comfortable soft carrier I've tried. Able to go for long walks without any shoulder or back pain which was the issue I was experiencing with the baby bjorn type carriers. Particularly good fit for small framed individuals like me. Fits my 6 month comfortably with room to grow into. Love it! Easy to use and put on when you're alone. Feels secure.